In this bizarre world, Operatives of the Department of State Services in Osun State have arrested a herbalist, identified simply as Jelili, and a commercial driver, Elijah Oyebode, for allegedly killing a 400-level student of the Osun State University, Miss Rofiat Adebisi a 400-level UniOsun student. The driver, who was paraded on Thursday, January 12, 2016, confessed that he hypnotised the deceased, who had boarded his vehicle from Ipetu Ijesa to Osogbo. 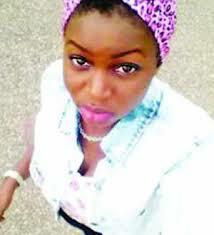 Oyebode said he subsequently delivered her to the herbalist, who paid him N10,000 for the job. He added that the herbalist had given him a charm and told him to bring any young lady who had not given birth to a child. The driver said the charm was in his pocket and he only made a body contact with the deceased. Following the body contact, Oyebode said Adebisi became hypnotised and he drove her to the residence of the herbalist in Ikirun, after other passengers in his vehicle had disembarked. He said the herbalist paid him and he went and dumped the luggage of the deceased in a bush. He explained that while doing that, the victim’s phone rang and he hurriedly removed the SIM card and threw it away. Oyebode said he later gave the phone to one Yusuf, who sold it for N20,000, adding that the proceed was shared equally between him and Yusuf. The driver said he lied to Yusuf that a passenger forgot the phone in his vehicle. He stated that his conscience started pricking him when he was leaving the herbalist’s house because he knew the lady would not come out alive. The herbalist denied Oyebode’s allegation, adding that the suspect was merely his contract driver. He said he did not know anything about Adebisi’s death. It was previously reported that the student’s corpse was found in Iragbiji, where it was dumped five days after she went missing. The state Commissioner of Police, Mr. Fimihan Adeoye, informed that the police and the DSS were cooperating on the case. He called on residents of the state to continue to cooperate with the police and other security agencies to make the state safer. The Deputy Coordinator of the National Association of Nigerian Students in the South West, Mr. Sheed Afolabi, commended the security operatives for apprehending the suspects. He appealed to them to also work harder to find the two final year students of UNIOSUN, Samuel Eke and Robert Akinduro, who had been missing since September 5, 2016.